A great plant in all of its parts. Beautiful intricate large blue gray leaves with an underside of white form substantial clumps. In high summer flower spikes rise up to 3′ bearing dense sky blue orbs of flowers- the structure of the orbs gives them a metallic glint. Amazing. 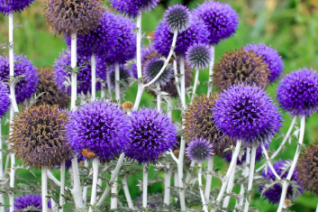 Obviously where it got its common name of globe thistle. Long lived herbaceous perennial for fast draining rich soils in full, hot sun. Spreads to form substantial clumps in time. Avoid sodden soils and heavy un-amended clay. Great on slopes. Completely deciduous in winter. These flowers seem to be made for butterflies- all sorts visit the flowers frequently. Light deer resistance. Plant with other large sun loving perennials to match the vigor and scale of this plant.